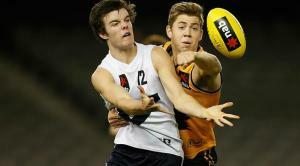 WA has spolit the title hopes of Vic Country, defeating them in the final round by two points. Vic Country produced a strong first half, jumping out to a 31 point lead midway through the second term as Lukas Webb (Gippsland Power) kicked his third goal, and Pat McCartin (Geelong Falcons) kicked back to back majors to put Country in control. Late goals to WA reduced the margin to 23 points at half time. Webb added his fourth to start the third term, but it would be the last Vic Country goal of the game at the six minute mark. Late goals to WA reduced the margin to nine points going into the final quarter. Neither team could find a much needed goal to start the final term, with six behinds being scored in a defensive end to the match. Finally Clem Smith helped WA hit the front with the only goal of the final term at the 17 minute mark, helping claim his sides first win of the Championship. Webb was the standout for Vic Country with 4 goals, 6 marks and 4 I50s, and was among the best with Dan Butler (North Ballarat Rebels - 11d, 5 tackles, 4 I50), Hugh Goddard (Geelong Falcons) in defence and Rowan Marshall (North Ballarat Rebels) in the ruck 11 hitouts). Other that led the stats count were Cunico (Gippsland Power - 16d), Mathieson (Geelong Falcons - 16d) and Dixon (Geelong Falcons - 15d).